This has been a busy month for us with friends visiting and the girls' schedule brimming with what they call "stuff". In between, there has been Mutton Korma and Mangshor jhol but first let me talk about the stuff. This "stuff" seems to have taken over their lives, making me and their dad run around, dropping, picking up, taking off work to attend school meetings that discusses new test patterns and such obscure stuff and then off to attend more obscure events where I am supposed to help my kindergartner make dolls for Heritage Day. Yes, you heard it right. Dolls !!! At first when the school sent home a letter seeking volunteers for the event, I quickly trashed it. I had volunteered at LS's class for Valentine's Day and enjoyed myself immensely but I had also found that the class-moms were super craft-y, so no way was I going and making a fool of myself in this project, I decided. Them Dolls, I am not making, I had reassured myself several times. In a couple of days however LS started complaining. A few of her friend's parents had come in to help make the doll and she wanted me to be there too. "Their doll is going to be perfect. Mine will be made by Mrs.Z and it will not be that good", she wailed. Apparently the child has more faith on me than her teacher. God, don't prove her wrong. Please. So very hesitantly, I e-mailed the teacher and landed in her school one day, only to hear that LS did not want her doll to be Indian. "Err LS...but it is for Heritage Day. You have to make something from the country where your parents and grandparents are." Now her Baba is more Bengali than most and speaks nothing but Bengali at home and not even an alien from Jupiter would mistake him for a non-Indian. "What do you mean his side ? He is from India too," I tried to drum reason in to her. "But Thammi doesn't live in India. They live in XYZ", she wailed, XYZ being a suburb about 3 hours from Calcutta. She was visibly depressed at the revelation that XYZ was indeed in India and then her interest in the doll took a dive. Thankfully, the kids had already done the cutout and the drawing etc. in class. All we had to help was with the costume and hair. With the variety of supplies available in school, this did not seem as daunting a task, as I had imagined. And guess what I learned in Kindergarten ? How to use a glue gun! Picture of her doll is in the Kid's Blog. The best thing amidst all this running around, was the Holi party that we pulled off on a whim, one Saturday. With temperatures dipping to 40s on most days and it being really chilly, the idea did not seem great at first. But then how is a Holi party, Holi if done in May ? Tell me? 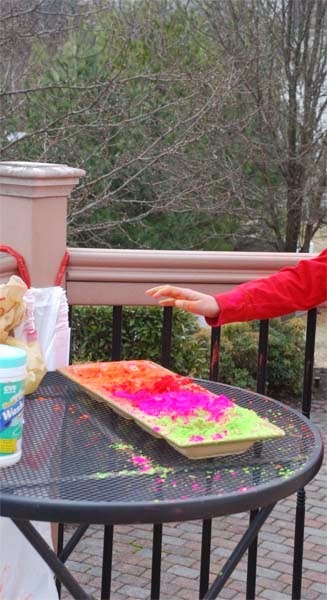 So, after checking weather.com umpteen times, when Saturday showed promised of going into higher 50s, we bought abir, took a day off to cook and played Holi. I have never been a Holi fan to be honest. What with my OCD and such, behind every colored face all I see is hours of clean up. But for this once, I steeled my resolution, shoved my OCD into a closet and shut it tight. And guess what ? The colored faces turned out to be happy and very easy to clean. The girls and their little friends loved the riot of colors and had a blast. Though I was afraid that BigSis might not like the mess, she enjoyed her first time playing Holi thoroughly. LS enjoyed herself at the beginning but with color permeating in her hair, she soon got fidgety and wanted to take a shower. At least one of them has got my genes. I usually marinate mutton overnight but if you are short of time an hour or two should be okay. Now heat some oil in a wide mouthed pan. Now add the mutton along with the marinade. Now "bhuno/kashao" the mutton for next 30-35 mins. Water will release from the mutton and you will see oil surfacing. 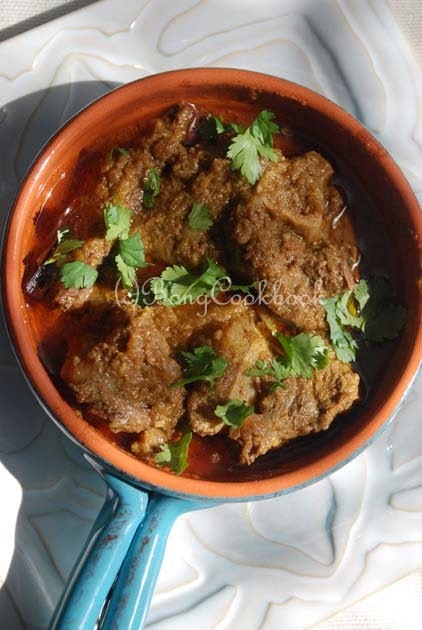 Add this coconut-kaju paste to the mutton and cook for another 15 minutes. Close the lid of the pressure cooker. 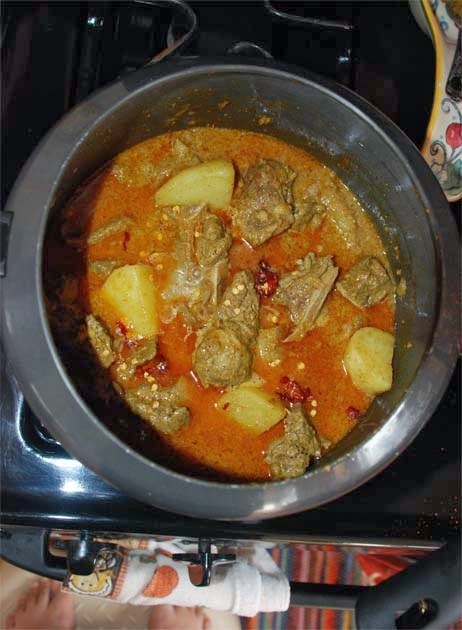 Once the steam has reached, lower the heat and cook mutton at low heat for about 20 mins. Next, raise the heat and cook for another 5 mins. Let the pressure cooker release steam naturally. Open the cooker to an awesome arora and serve the Korma with rice or pulao. Bhindi or Okra is one of my favorite veggies. Surprisingly, I don't cook it that often. Last weekend when I finally got some okra, I wanted to do a simple Bengali "Dharosh Aloo Charchari", a dry potato-okra sabzi with a tempering of paanch phoron and barely any other spice. But then I saw this recipe of roasted okra and thought -- "Why Not?". 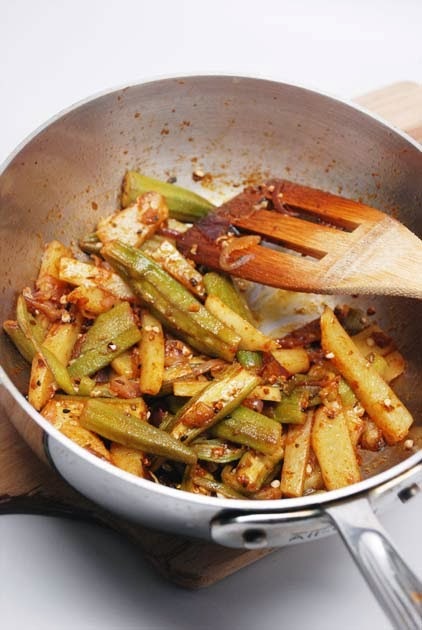 So then I mixed both ideas, first roasting the okra and then doing the paanch phoron tadka and cooking with potatoes. The result was lovely as anticipated. Since, I was anyway deviating from the norm, I also used Anjali's( who blogs at Anna ParaBrahma) Koli Masala(given to me by lovely Manisha of IFR), in this dish. I have been meaning to use it with fish but then I just put a bit of that gorgeous masala in the bhindi and the flavor was amazing. For this particular dish, you can use any other spice you like too. Cumin or Coriander powder would be a natural choice. You guys might be thinking, that I forgot about the giveaway. But I do remember. 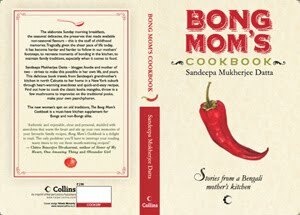 Winner of Monica Bhide's book is Mausumi Ray. Her comment was -- "My favorite spice is actually a combination of spices that is paach foron. I use it in my Musur daal, kumro chhokka, shak bhaja, achari murgh, chutney and in many more dishes. :-)". Mausumi, look out for an e-mail and please respond. And wait, wait, after many moons and seasons, I have again updated the Kid's Page. Even if I don't post recipes there that often, I will be posting projects that the kids do or about the books they read. So keep checking. This time it is a 3D-earth layer model project. Rinse and pat dry okra/bhindi/dharosh. I had about 12-14 of them. Trim away the tips and the stem ends. Then slice each okra in two along the length, so that they split open. If the okra is really tender and you prefer to keep it whole, do so. Put all of the sliced okras in a large bowl. Note: The spices are your choice. You pick any two that you think would go in this dish. Get creative. I picked Koli Masala because I had some great smelling home-made masala by blogger friend Anjali Koli and given to me by dear Manisha. Next take a large-ish potato. Peel and chop in thick, long, fry like pieces. Line a baking sheet with aluminum foil. Lift the okra and place on the sheet in a single layer. Bake for about 20-25 mins. Timing might vary. You will see okra will be tender and lightly brown. Now heat about 2 tsp of Olive oil in a frying pan. Go with Mustard Oil for sharper flavor. Add the potatoes. Sprinkle some turmeric, 1/2 tsp of Kashmiri Mirch and saute the potatoes. Cover and let the potatoes cook. Once potatoes are done, put in the roasted okra and toss. Add salt to taste. Serve with roti for best taste. Or eat just like that. Tell me, when you hear the word or words "Lobongo Lotika", what is the picture that comes to your mind ? At the risk of stereotyping, I think of a slender girl standing at the bus stop, maybe Manicktala, looking out into the horizon for Bus # 34B, her rippling hair in a long braid snaking down her back, her hands clutching a book and on that book her name scribbled in deep blue ink -- "Lobongo Lotika Bhattacharya"! Or even "Lobongo Lotika Talapatra". But never ever a "Lobongo Lotika Pandey" or "Lobongo Lotika Patel". Nope they won't do. And that is the only reason that I could not name my daughters "Lobongo Lotika". It doesn't ring well with their last name. That and because no one else agreed to my naming suggestion. Nomenclature aside, it is a traditional and famous Bengali sweet. Bong sweet is not all about curdling milk and making chhana, you know. And for the likes of me, a Lobongo Lotika is way way more delicious than a Sondesh. Ahh, that grainy sweet kheer wrapped in a flaky parcel of dough and hugged by a sugar syrup. Just the thought of it makes me cave in. A similar sweet that would clog my heart with happiness was "Kheer er Shingara". I have had it only at a very few places, one of the very best being a small store called "Buri'r Dokaan" near my Dida's home. It looks exactly like a regular shingara or samosa, a tad smaller, but it has a sweet filling of kheer/khoya and is then dunked in sugar syrup. Bliss is this. But sadly that store is no longer there. Neither is my Dida. 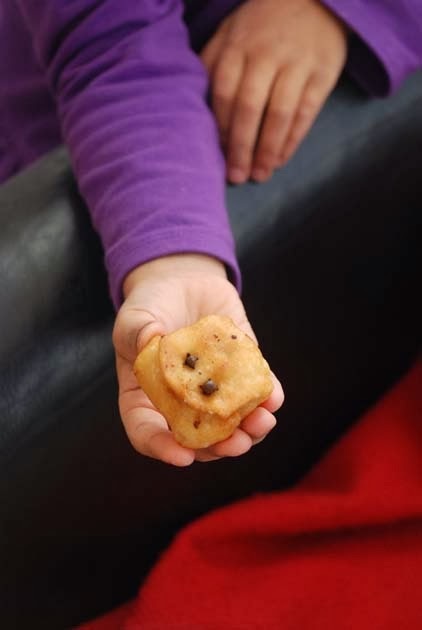 The Lobongo Lotika is built on the same framework, except that it is a delicate square shaped parcel of flour, stuffed with kheer, the flaps of which are secured with a lobongo or clove. At the end of the sweet sensation, biting into that clove brings about a fresh, pungent and spicy burst of flavor. A very different and refreshing note to end the sweet journey. I used to be a bit weary of the lobongo as a child and wished mine didn't have any. I would always eat around it. But as I grow older, I have come to appreciate the innovative mind of the sweet maker who first came up with this sweet and used a clove to tie up the loose ends. What brilliance! Now, Labongo Lotika, though very good to eat, is slowly losing its place in the world market. 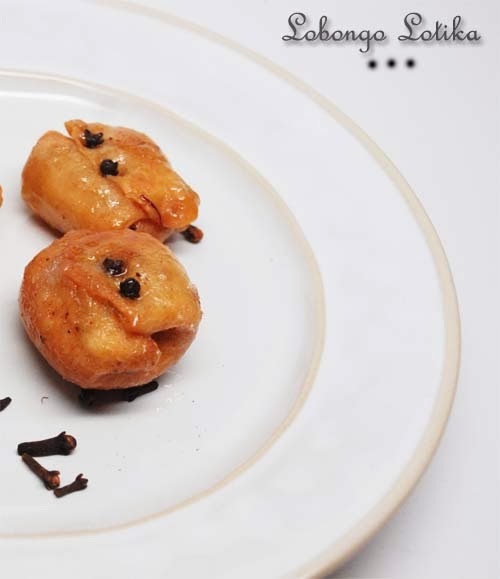 Bengali Roshogolla is what the world swears by. So, nary a Lobongo Lotika can be found outside of specific dessert stores or mishtir dokan in India. To appease to my cravings, I decided to take matters in my own hand. And then I called up my Mother. "Ma, how do I make Labongo Lotika"
"Do you have fever? Are you okay? Did you take antibiotics? Or is it indigestion? Take 4 globules of Carbo Veg." "Ma, I am perfectly fine. Why do you ask?" "Then maybe mental anxiety? Alzheimer? I will send Brahmi Amla hair oil with someone next time"
"Okay, I don't know why you are saying all this?" "Well, who in their right mind would want to make Lobongo Lotika? And off all people, you"
"Just tell me how to"
"It is not so simple and I don't remember exactly. But it is just like the pyaraki I made on Wednesday." With that she gave me a rough recipe as to how to make the sweet. Since making khoya kheer at home is not my forte, I decided to settle for a coconut khoya filling. 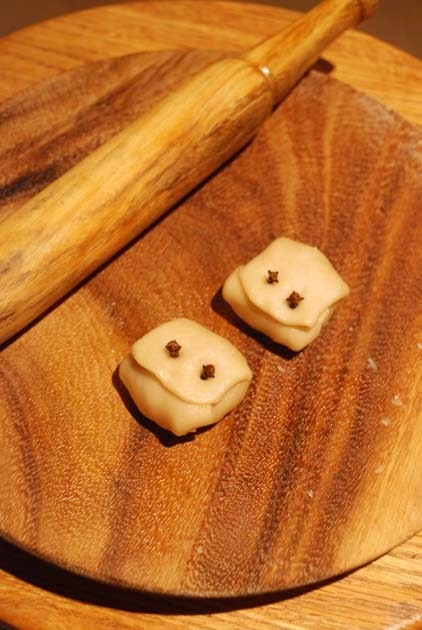 I also checked Deepa's blog Hamaree rasoi for the exact measures to make the dough. I made a batch of about 20 labongo lotikas and they were truly delicious. The ones hot off the syrup were best. The ones stored for later were also good but they were a little dry with the sugar crystallizing on their outer surface. Both ways, my cravings were fulfilled. And really, it is not that difficult. I did it on a working week day evening.I simplified by not making the kheer which my Mother thinks should be the key ingredient. Tch, tch.Instead I made a coconut-khoya stuffing. Compromise. Compromise. Now you take rest. And eat two of those Lobongo Lotikas. 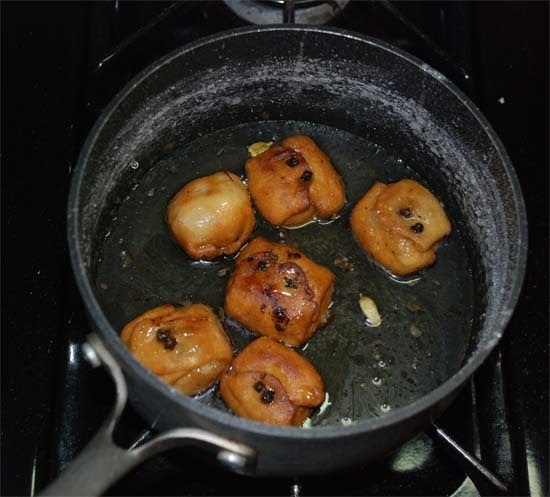 And check "Making traditional Bengali sweet lobongo Lotika" off your "List of things to do before I am 120". This stuffing measure is good for about 30 sweets. I make in a large quantity and freeze the rest. This same stuffing can be used for patrishapta too. Mix the grated coconut with the sugar slightly pressing with your fingers till sugar melts and mixes with the coconut. Add some cardamom powder. Now crumble and add the Khoya and 2 tbsp of Condensed Milk. Keep stirring till mixture becomes light brown and sticky. It should easily come off from the sides by now. This will take about 30-35 mins. At this point take a little of the mix and see if you can fashion a flat disc out of it. If it is too sticky you may have to cook a bit more, else you are good. Soften the khoya in the microwave. Then put a pan on the gas and add the khoya to it,crumbling up with your fingers. Add saffron to 2 tbsp of warm milk and let it soak for 5 mins. Add this to the khoya. Once the khoya and sugar is well mixed, take it off heat. Let it cool and then use for your stuffing. With your thumb and forefinger, rub the oil into the flour mixture so that the flour looks all crumbled. Then gradually add water and knead the flour into a dough. Water needed will be between 1/4th Cup to 3/4th Cup. Start with less water and gradually add more as needed. The dough will be a little stiff unlike the dough for luchi or poori. 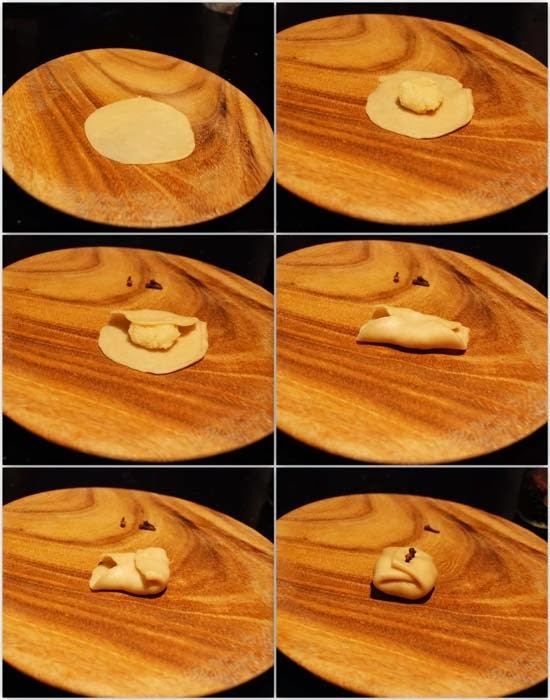 Make a smooth ball of dough. Cover with a damp cloth and let it rest for 30 minutes or so. From this ball of dough make about 12-14 small gooseberry sized balls. Dip each ball in little oil and then roll it out in shape of a thin disc about 3.5" in diameter. This will look like a small luchi or poori. Put the coconut-khoya stuffing in the center of the disc. Wrap the disc around the stuffing to make a neat parcel as shown in the pic. Secure the last flap with one or two cloves. Make this parcel like thing with the rest of the balls. You need the syrup to be thicker than a gulab jamun syrup. Once the syrup starts boiling at the surface and looks sticky, do this test. Take a shallow bowl of water. With a spoon take a drop of the syrup and drop it in the water. If the syrup dissolves, it is too thin for this sweet. If you see the syrup forming a thread like structure on the water surface, you know syrup is ready. Heat enough oil for deep frying in a Kadhai. To test if the oil is hot enough, chuck in a small piece of dough in the oil. If it rises up with bubbles, oil is ready. If it sinks, nada. If it burns, switch off the heat. 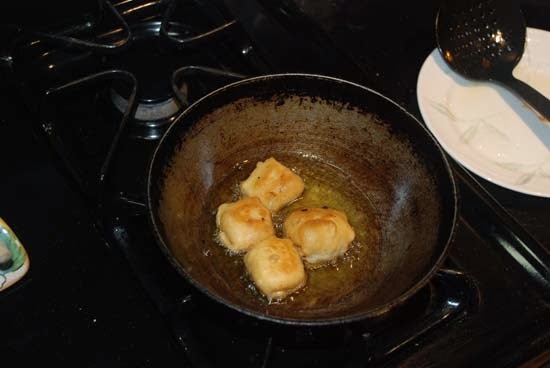 With the heat at medium-high gingerly lower the parcels in the hot oil. They should not jostle for space, so add only as many as will fit comfortably. Now lower heat to a comfortable medium and fry until both sides of those dough packets are golden brown.Remove with a slotted spoon and drain on paper towel. They taste best when hot off the syrup. But you can also cool and store in an air-tight container for 3-4 days. The sweet will not be as moist but still taste pretty good when had later. ....Or maybe the Nawab's lazy harem. I mean the Nawab never cooked anyway so it must have been either the Harem ladies (which I seriously doubt) or the chief bawarchi's sous chef(more probable) who took this shortcut approach to Chicken Kababs. It might also have been the Harem ladies in their Kohled eyes and betel juice stained lips who made these when economy was bad and they could not afford a sous chef or goat keema. The chief bawarchi of course would not take such demeaning shortcuts. In the worst case it could be the Nawab taking on the chicken keema because his umpteen wives went off to their maika, again economy being bad and all that. Ultimately I do not care who the pioneer was.It--this simple method of making kababs--was first introduced to us by a beautiful friend of mine who came straight from the Nawabi heartland of Luckhnow. Impeccable with her manners and beauty she was a dear friend for many years. And then something happened. Till this day I am not very clear of how one thing led to another but KA-BOOM and she wasn't a dear friend anymore. We still were friends but somewhere the tune was lost, the rhythm broken and those nights of having impromptu dinners together never happened again. Like every relationship, friendship often needs lot of time to nurture, grow and maintain. I guess we faltered somewhere along the line. Has that happened to you ? Can you pick up even after a friendship has been strained ? I still treasure the times we had together though and I am eternally grateful for the toor dal with a chaunk of jeera and a crush of garlic and these succulent,easy-peasy chicken kababs. Gosh, I would have never taken to them so dearly if they were not this easy. Over time I have introduced a lot of other things in the kabab depending on the day, year, season, what say you. I have made them spicy with the spices from the chicken masala balls. I have made them like meatballs which the kids love. Or I have just stuck to the rudimentary and this is how the H-man made it on Sunday for dinner. Since the recipe is almost non-existent I had planned to do a la-di-dah step-by step picture of the process as the H-man cooked. 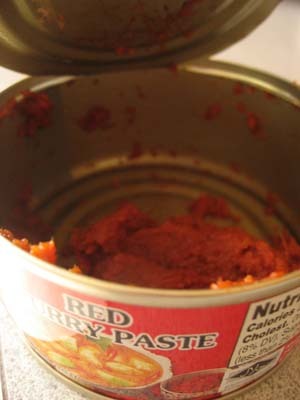 Instead I took pics of the red curry paste because I was making a wonton soup and I am partial to dishes I make. Bottomline, there are no picture and also no measured out recipe because if asked to measure while cooking, the H-man just rolls his eyes. The ground chicken(keema) that I get here is really fine and cooks fast. So we marinate it in various different ways involving ginger, garlic green chilies, onion, garam masala etc. I also add a little breadcrumb to it which keeps the moisture in. Earlier I would add an egg to the mix but I don't any more and it is soft and succulent as ever. Guess the breadcrumbs do the trick. Then i go ahead and add some crushed kasoori methi warmed between your palm, finely chopped bits of onion and finely chopped bits of green chili(optional). Mix it all together with a spoon. Heat very little oil on a flat fry pan or griddle. 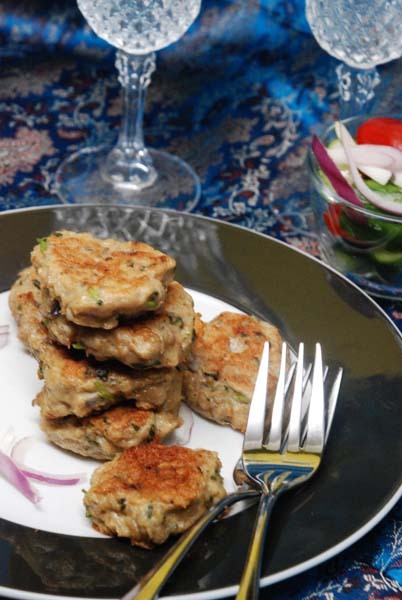 Fashion round tikki kind of patties from this spiced up keema. Shallow fry them till they have brown spots on both surface. 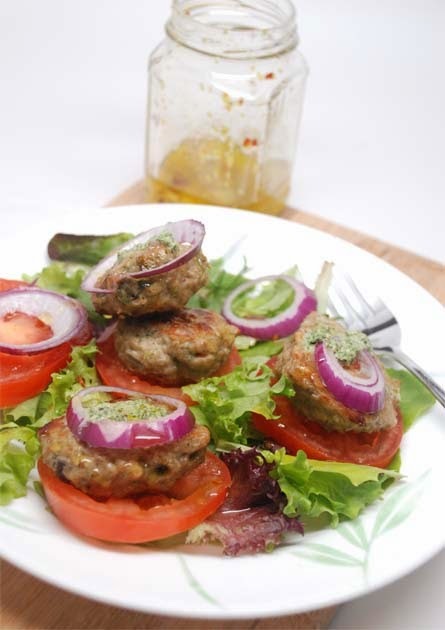 Serve the kababs with a raw onion-cucumber salad. 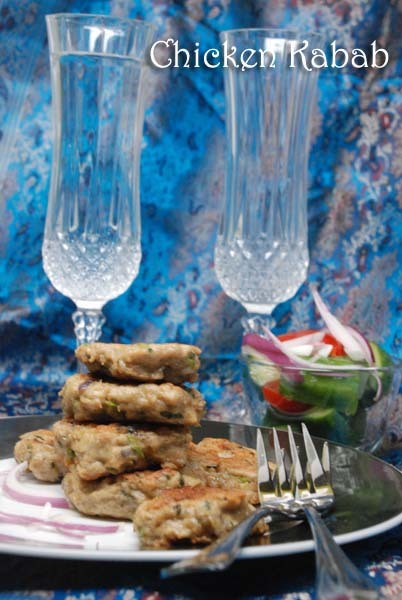 These kababs can be spiced in various different ways with spices to your liking. When I am short of time I will do nothing but add chopped onions, minced garlic, tandoori masala, green chilies, dry mint, some breadcrumbs, salt and few drops of oil to the keema and marinate it.On other days I might take more care. Either way they taste great! Start with 1 lb - 1.5lb of ground chicken. When buying from the butcher I usually ask chicken thigh meat with some fat to be made into keema. Blend few mint leaves, 2 green chilli, 1 fat clove of garlic and an inch of chopped ginger with 2-3 tbsp of thick yogurt. Add a tbsp of kasoori-methi warmed and crushed between your palms if you like the flavor. Mix well and keep aside for 30mins. Note: The breadcrumbs make even the baked kababs deliciously soft. If you are not adding breadcrumbs add an egg to the keema mix. Mix well. Keep aside for 30 - 60 minutes in the refrigerator. After 30 mins or an hr, take the keema out and fashion round shaped kababs by flattening them on the palm of your hands. Place on a greased oven proof tray. I prefer lining the tray with a greased aluminum foil which makes cleaning much easier. Once the oil is hot, gently add the kababs to the pan. Once the edges start browning, flip the kababs on the other side. Chicken kabas cook fast and since these kababs are not too thick, takes 3 minutes to cook on each side at medium-high heat. Bake at 350F for about 15mins. At this point you will notice that the underside of the kababs has started browning. Take out the tray and flip the kakbas. Bake for about 10 mins or until kabab is done.